As many other girls, my older daughter is in love with Hello Kitty. 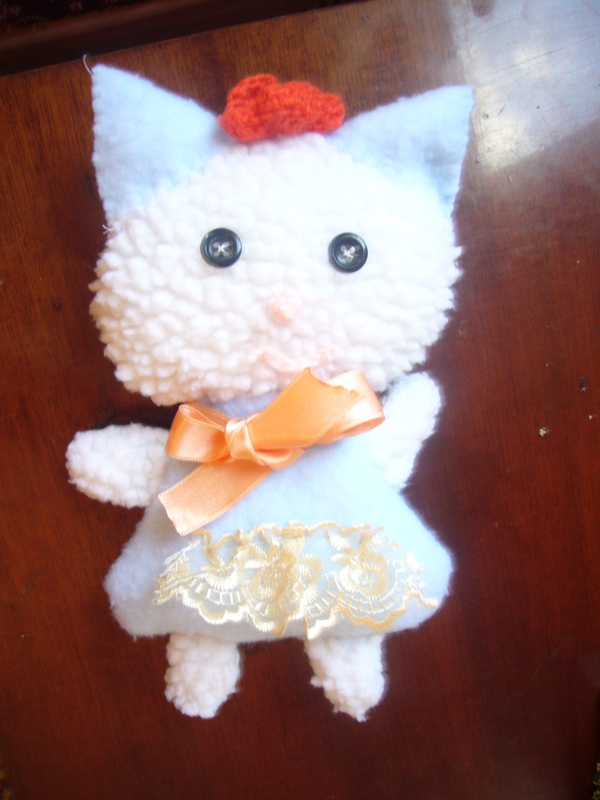 Here is our handmade soft toy Hello Kitty. We had a soft coat of our baby girl. She grew out of it. So, we made this toy together with my older daughter. We did not use any patterns for it. I drew a sort of pattern for this soft toy on a sheet of paper. Cut it out and placed on the fabric. It took us about 1 hour to make this soft Hello Kitty toy. This entry was posted in Uncategorized and tagged crafts, handmade, handmade hello kitty, handmade soft toy, hello kitty, hello kitty toys, kids, making soft toys, parenting, soft toy, toys. Bookmark the permalink. That is so cute! My 5 year old would love that… I feel a little sewing coming on…. I’m glad, you like it. Have to admitt, this is the first toy that turned out cute. The rest of them did not look good.